Soccer has been steadily growing its popularity since the start of the 21st century, and it is considered to be the most popular sport in the world. Rugby, the version of soccer that permits handling of the ball, is equally as popular as soccer. Both are rough sports, involving a lot of running, kicking, and jumping, and a ton of stamina as well. Although not everyone is physically fit to play the rough sport, soccer and rugby, the version of soccer that permits handling of the ball, has gained millions of fans eager to watch the exciting games brought about by each season. In the Philippines, the love for soccer has been awakened in most Filipinos by the recent stunts pulled off by the Azkals, the Philippine National Soccer Team. Despite the past decade giving our country poor performance in the FIFA World Cups, Azkals awakened the spirit and support for this sport. Now the youth and even the adults are hooked and eager to learn the sport, as they yell and cheer for victory while watching the soccer and rugby matches in television. Blog post courtesy of Alma who writes for a coupon blog catering to World Soccer and Rubgy. My dad is a certified health buff who loves everything organic. Ever so often he picks stalks of malunggay leaves from our tree, and makes a brew with fresh lemongrass stalks and fresh pandan leaves, all from our garden of course. Mixed in with raw honey and a squeeze of lemon and he's a happy man. When I came across some Malunggay Powder, I was very delighted because the recent Typhoon Pedring has left the malunggay tree bare. Apparently, it is a valued dietary supplement due to its nutritional properties. 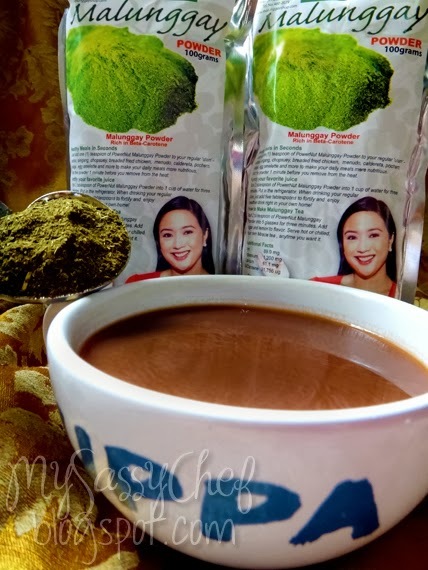 A little research tells me that dried malunggay leaves in powder form has 10 times the Vitamin A of carrots, ½ the vitamin C of oranges, 17 times the calcium and 15 times the potassium of milk, 25 times the iron in spinach and 9 times the protein in yogurt. Now that's something we all want to have, right? I have to admit, even I am not fond of eating malunggay leaves. But when it's this good to drink, even I won't have to worry anymore. 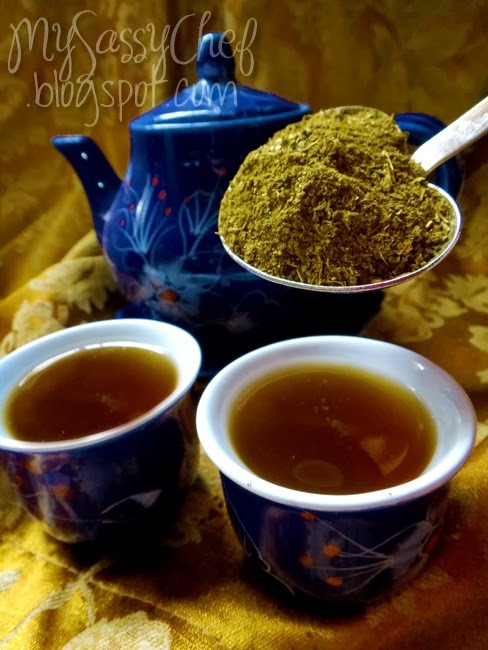 For moms, the malunggay powder is something you can infuse into your children's drinks. It's a versatile ingredient that can be mixed in with all kinds of food and drinks, and anyone would barely notice it. You can even mix it in with your meals, you just have to be creative. Enriching your family's diet has never been easier. I looked forward to making their famous malunggay fruit shake, but the typhoon left me with no good fruit to buy this weekend. So I brewed some honey-pandan malunggay tea for us, and a nice malunggay chocolate drink for my brothers. Surprisingly, the chocolate drink was really delicious. My youngest brother said there's something different with his hot chocolate, and even said that it tastes better than the usual. They are the pickiest eaters in the world and would always have a fight with dad when he sometimes tries to make us eat boiled malunggay leaves, but the fact that they liked the malunggay powder-infused chocolate means that this product is an effective way to fortify your family's food. The tea was actually very nice, with a mild flavor that would appeal even to those who are used to the taste of expensive tea. It doesn't have much of that signature malunggay taste that many people don't like. When I opened the foil pack, I thought I smelled hints of honey in it, but the dark green powder is pure ground malunggay leaves. It has a mild and sweet flowery scent with it, and when brewed, it reminds me of the dried rosebuds tea my mom bought from a trip Hong Kong before. A perfect pick-me-up for this gloomy weather. Boil pandan leaves in water. When water starts to boil, mix in the malunggay powder and boil for two more minutes. Strain into teapot, add lemon juice and honey to taste. Boil water and remove from heat. Place cocoa powder and malunggay powder into the water. Strain into a cup and pour hot water into it. Add a dash of honey or sugar to taste. Add milk if desired.